PDF Page Number (A-PDF Number Pro) is an extremely easy to use and inspiring tool. PDF Page Number is indispensable PDF watermarking software for any offices, lawyers, legal professionals etc that handles any volume of Bates stamping in PDF documents. With PDF Page Number, you can batch add Page Number to Acrobat PDF documents. Save time: offer bate numbering on multiple PDF files at a time. Make your PDF bates stamping work perfectly. Enable you to add text, page numbers, prefix, suffix etc. Support adding number with symetry page mode. Support Bates numbering multiple PDF files with continuous numbering method. 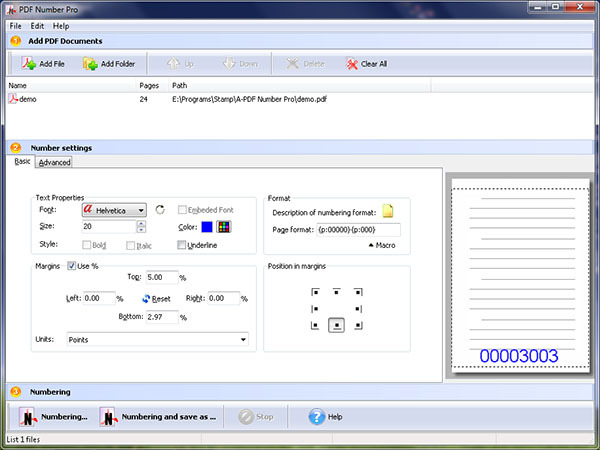 PDF Page Number allows you to perform batch PDF stamping at a time. PDF Page Number supports formatting of Bates number based on Font Size, Font Colors etc. Moreover, this tool provides you with "Add Folder" option to add multiple PDF files at a time and shows preview of stamped PDF pages. You can align the page number, date & time based on top, bottom, left, right, middle etc properties. PDF Page Number doesn’t need Adobe Acrobat Reader and is compatible with Windows 98/2000/ME/XP/2003 and Windows Vista. In addition, PDF Page Number supports defining label prefix and supports "Drag and Drop" to add PDF files. Add numbers to selected pages of documents. Three display modes: number, ROMAN(IV), roman (iv). Three positions to select: Bottom Left, Bottom Middle, Bottom Right.